(TibetanReview.net, Jan19, 2018) – The Finance Department of the Central Tibetan Administration (CTA) at Dharamshala, India, has on Jan 17 launched a non-banking financial company that will play active role in financing livelihood and related projects for Tibetan exiles. 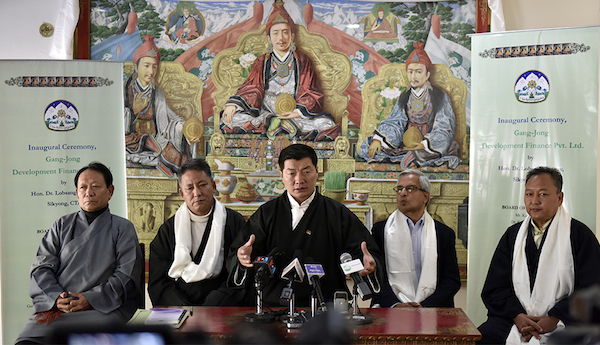 CTA President Lobsang Sangay was cited as saying the Gangjong Development Finance Pvt Ltd fulfilled the need for a financial corporation in the Tibetan community. “This is one of the most strategic programmes of CTA conceived and designed to drive forward the Kashag’s 5/50 policy addressing the critical need of financial literacy and inclusion services for Tibetans in general and Tibetan enterprises and start-ups in particular,” he was quoted as saying. Through the 5/50 vision the CTA seeks to achieve genuine autonomy for Tibet through the Middle Way Approach of seeking autonomy, not independence, in the next five years, and, should that fail, to sustain the struggle for the next 50 years. Last year, the CTA’s finance department rolled out a 100-million-rupee loan scheme for Tibetan hosiery and sweater traders for their winter business activity. At least 90% of those loans were stated to have been already repaid. “With the success of the sweater seller loan scheme, we are now planning to expand the next scheme to 200 million rupees covering not just Tibetan sweater sellers but also Tibetan-owned micro, small and medium enterprises (MSME), and education loans,” Sangay was quoted as saying. He has expressed hope that the Gangjong Development Finance Pvt Ltd could become a normal commercial bank after several years. Its three board members are Finance Kalon (minister) Mr Karma Yeshi, CTA’s Chief Planning Officer Dr Kunchok Tsundue and Mr Alok Prasad, a MicroFinance expert.